With the World Salsa Summit just a week away, competitors around the world are gearing up for this annual event in Miami, Florida. Some will even be competing for the first time! In anticipation of the event, I thought I’d answer some of the most frequently asked questions about heated or “just dance” competitive divisions. If you’re thinking about competing for the first time, I highly suggest starting off with heated divisions (as opposed to a showcase division, where couples dance a choreographed routine to a specific song). In a heated division, several couples take the dance floor at the same time and dance to a song in a specific genre played at random. Since you don’t know what the song is going to be, movements and turn patterns are improvised. It’s a lot of fun, and requires less preparation than competing with a choreographed routine (there are no steps to remember!). Heated competitive events exist for professionals, amateurs, rising star, and pro-am couples. I haven’t been dancing for that long and I’m nervous about competing against dancers with a lot more experience. Pro-Am and Am-Am heated (or just-dance) competitions always have at least three different levels––beginning, intermediate, and advanced. This means you’re guaranteed to compete against dancers of similar experience and level. Bigger competitive events often break those levels into even more categories and will have separate rounds for novice, beginner, pre-intermediate, intermediate, pre-advanced, and advanced dancers. In addition, competitions often have a 40+ or 50+ category (sometimes called a Silver Division) and a Junior category for dancers younger than 18 years old. Pro-Am competitive divisions are generally broken down by lead and follow as well. This allows followers to compete against other followers and leads to compete against other leads in what are most often called “Pro-Am Female” (for followers) and “Pro-Am Male” (for leads) divisions. How many heated or ‘just dance’ categories should I enter at a single competition? Enter at least three to five just-dance divisions at a single competitive event (more if you’re not competing in a showcase division). Why? Because competing in several categories at a single event makes all the time and money you’ve invested preparing and traveling to the event worthwhile. Think of all of these aspects as sunk costs: lessons, coaching, costumes, airfare, accomodation, taking time off from work. On competition day you’re going to wake up early to get ready, take time to do your hair and makeup and then you’re going to spend hours in the ballroom waiting for your division to be called. It only makes sense then to enter several categories at a single event to get the most out of all your preparation! Can I compete in more than one experience level at a single competition? Yes, you’re allowed to compete in as many dance styles as you want at your current experience level (beginner, intermediate, advanced, etc. ), plus one level above. Enter the higher level in addition to your current level! Competing against more experienced dancers will challenge you and help you grow (and that’s ultimately what competition is all about!). Plus, it’s really normal to be nervous for your first heat in a specific dance-style, so the higher, second level is kind of like a ‘second chance’ to go out on the dance floor once you’ve gotten all those nerves out! Sometimes dancers even end up placing in the higher level and not in their actual, current level because they feel more relaxed the second time they go out on the floor. More relaxed = you’ll dance better. Do I have to compete in the same experience level for each dance style ? No, you do not. 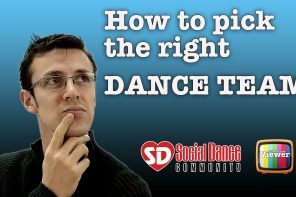 For example, if you’ve been dancing bachata for years and you’re super comfortable with it, but you’ve only just started taking classes in salsa and hustle, you might choose to enter a pre-advanced bachata division and a novice salsa and hustle category. In this case, you could also enter the advanced bachata category, and the beginner salsa and hustle categories. I don’t know what levels to enter! What should I do? What if my professional partner has several students and we’re all competing in the same dance-styles, at the levels? Not to worry! It’s common for professionals to compete with more than one student at a single competitive event, as well as for their students to compete in the same level (i.e. against one another). The organizers of the competition will make sure to break each round into smaller groups, so that a single professional can dance with all their students in a single division. Generally this means that in your ‘round’ you will take the floor with your professional partner and a few other pro-am couples who are competing against you in your level and dance style. Sometimes, however, you may go out on the floor with couples who are competing in a different level. For example, if you are competing in “Pro-Am Salsa Female Beginner” category, you may dance at the same time as some of the competitors in the “Pro-Am Salsa Male Beginner” division. Other times you may be on the dance floor at the same time as competitors in the “Pro-Am Salsa Female Intermediate” category. Don’t worry! The judges know that you are not in the same division as these other dancers and will make sure to score you accordingly. 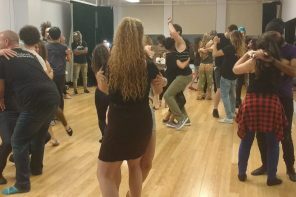 Occasionally, if the competition or the division is small and your professional has a lot of students in the same category, you may be asked to compete on the dancefloor in a just-dance or heated division without other couples on the floor at the same time. At first this can feel a bit intimidating! Make sure to talk to your coach and mentally prepare for this situation at competition so that it doesn’t throw you off. Then, work that floor! Instead of being nervous that everyone is watching you, reframe it so that it feels like “woah, isn’t this cool! I have all the space. I don’t have to share!” But don’t take the fact that you’re the only one on the floor at that time for granted––you still have to work for that title! Dance hard, enjoy yourself, and execute everything you’ve been practicing in the studio. What if my professional partner gets tired during all the different heats? Their job is to dance! Just like you’ve likely spent hours and hours training for your professional career and developing the right skill sets, so has your professional dance partner. One of those skills? A very, very high level of stamina that’s required to dance in 10 or 12 or 25 different heats in a few hours. Can I have more than one professional partner? Yes, you can. For example, if you want to compete hustle, and your professional partner is not a hustle dancer, you can compete with a different pro for that division. Or maybe your professional partner is not able to go to an upcoming competition because he or she is already booked at a different, non-competitive event. In this case, it is perfectly acceptable to attend the competitive event and compete with someone else. The polite thing to do is talk to your current professional partner and explain that you still want to attend the event and ask if he or she has a suggestion for who you should compete with in their absence. If your professional partner really has your interest at heart, he or she will want you to attend the competitive event even if they can’t, because they know that doing so will help you keep growing as a dancer (and there aren’t all that many competitions throughout the year!). Leave a comment below if you have another question about competition, or any advice to share!